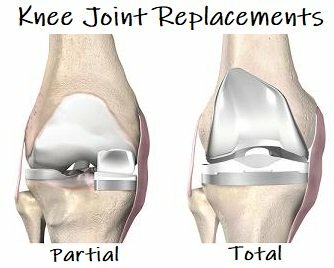 Knee joint replacement involves replacing part or all of a knee joint that has been damaged or worn away with a prosthesis - a new joint made of metal and plastic. The aim of a knee replacement is to reduce pain from arthritis and improve function. Knee replacement surgery is the most common joint replacement surgery performed. 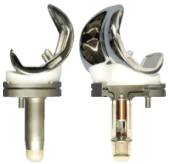 There are about 80,000 knee replacements carried out per year in the UK and 130,000 in the US. 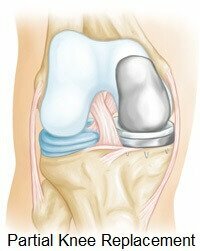 A partial knee replacement it where only part of the joint is removed and replaced with a metal and plastic prosthesis. It is sometimes known as a Unicompartmental Knee Replacement (UKR) or Unicondylar Knee Arthroplasty. A partial knee joint replacement is most commonly done on the inner side of the knee as that is the most common part of the joint affected by arthritis, and then the outer side. If the arthritis is at the kneecap then the back of the patellar and front surface of the thigh bone are replaced - visit the patellofemoral arthritis section to find out more. With a total knee replacement, all the bone and cartilage at the bottom of the thigh bone (femur) and at the top of the shin bone (tibia) are removed. The entire joint is then replaced with a prosthesis (implant) made of metal and plastic. 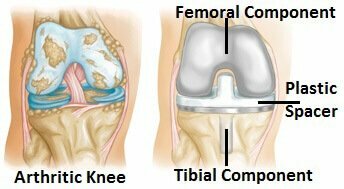 This procedure is also known as a TKR or Total Knee Arthroplasty. You can even watch video footage of knee replacement surgery so you can see exactly what goes on! But let's start by looking at the indications and alternatives to knee replacement surgery. We will the go on to look at what happens during surgery, the rehab process, common problems associated with surgery and the recovery process. Knee joint replacements are most commonly carried out to treat advanced osteoarthritis of the knee. This is when the cartilage lining the joint becomes damaged and wears away, causing pain and limiting function. The knee joint is where the ends of the thigh and shin bone meet. Each bone is lined with cartilage which allows them to glide smoothly over each other. With osteoarthritis, the cartilage thins and the bone underneath begins to thicken laying down new bony spurs, called osteophytes. As arthritis progresses, the cartilage can wear away altogether and you get bone rubbing on bone. Arthritis pain can end up so severe that normal daily activities such as walking and going down stairs become extremely painful and difficult. The knee can even become deformed. When this happens, the best course of action is knee joint replacement. If your symptoms are not as severe as these, a knee joint replacement is probably not needed and other treatment methods are more appropriate. Visit the Arthritis section to find out more including treatment options for arthritis. Some people worry about leaving it too long before having a knee replacement. Rest assured, there is no need to worry. Arthritis does not get to a stage where it is so bad that the surgery can’t be performed, so there is no harm in waiting. However, if by waiting you are losing lots of strength in your muscles from not being able to keep active, it is likely to take you longer to recover after surgery. Most people with osteoarthritis do not require a knee joint replacement. Arthritis pain can often be successfully managed without the need for surgery, by using treatments such as exercises, pain relief, PRICE and injections. If you want to know more, visit the Knee Arthritis Treatment section for more information on effective ways to treat osteoarthritis of the knee. Knee joint replacement is only performed when arthritis has become advanced and non-surgical treatments are no longer adequately controlling the pain, or when function is serious inhibited. You can find out loads more about total knee replacements and partial knee replacements in our dedicated sections, including what happens during surgery, the recovery process, common problems and answers to frequently asked questions regarding knee replacements.